SETI DEVI, Kathmandu (Thomson Reuters Foundation) – For Hira Pulami, seeing the charred trunks of the precious pine trees he grew up with is a cause of lingering pain. But he is hopeful that Nepal’s new forest-fire detection system will help avoid a repeat of the recent catastrophe that struck his village. 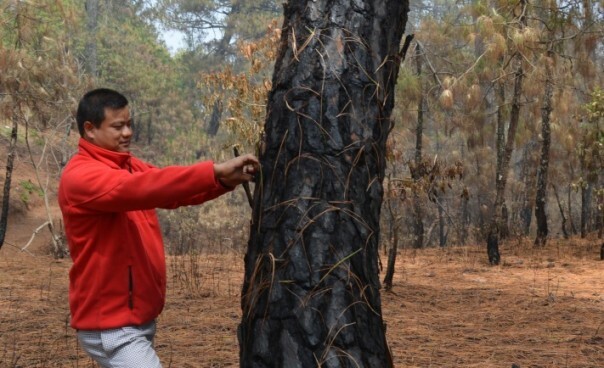 “I myself planted with these hands many of the pine trees that burned down during the raging forest fire in Seti Devi last month,” he said sorrowfully. Seti Devi is a scenic mountain village, 16 km southwest of Kathmandu. Popular with tourists, it is renowned for its ancient pine trees. Pulami was asleep when the blaze erupted in his village on the night of April 14, proceeding to burn for almost 36 hours. Army troops, backed by police and fire fighters, arrived some 21 hours after the fire began. The delay was caused by the village’s location on a steep mountain without proper road access, the 40-year-old said. Pointing to a large area that now looks like unsightly wasteland, Pulami said that, after engulfing most of the tall pines in Seti Devi, the wildfire rapidly swept through the forests in the adjoining villages of Sheshnarayan and Chhaimale. “Local people used every resource at hand to douse it, but in vain, for it was too fierce to be tamed by just a few of us,” he recalled. Besides thousands of decades-old pine trees, precious medicinal herbs were also reduced to cinders in just a few hours, Pulami said, his voice choking with grief. Police deputy superintendent Guru Bishnu Kafle told Kantipur News TV on April 22 that, since the dry season started in the third week of March, Nepal had already witnessed forest fires in over 1,000 places, destroying both community and public forests and protected areas including the Chitwan National Park, Parsa Wildlife Reserve and Annapurna Conservation Area. The forest fire season continues until mid-August, but official records indicate that about 60 percent of wildfires occur in March and April, Kafle said. The major causes include mismanagement of the ‘slash and burn’ agriculture method in forests, lack of community awareness programmes, careless use of flammable substances, and the absence of plans to demarcate firebreaks. Sundar Sharma, coordinator of the UNISDR-Regional South Asia Wildfire Network , said preparedness and response mechanisms for forest fires are weak in Nepal. According to the Nepal forest fire management chapter of the network, around 239,000 hectares of forests were destroyed by wildfires in 2009-2010 alone. Temperatures are rising in mountain areas close to Kathmandu, largely due to increased deforestation, as trees are cut down for fuel in the winter and land is cleared for urbanisation, which also hikes vehicle emissions and timber demand. The risk of forest fires is growing in line with these trends. Pulami said forest fires have become more frequent as the local climate has warmed over the past decade. In the past, the winter cold would last until late April, but now warm days are occurring as early as mid-March, he explained. “The latest forest fire incident in my village was the fourth in the most recent three years of my 40-year life,” he said. So he was glad to learn that through a new SMS service that sends alerts to mobile phones, he can now be informed of a wildfire incident within just 20 minutes of its detection. The “Forest Fire Detection and Monitoring System” was launched in March 2012 as a pilot programme in a few of Nepal’s forest districts by the Kathmandu-based International Centre for Integrated Mountain Development (ICIMOD). Technical support has been provided by the U.S. National Aeronautics and Space Administration (NASA), with funding from USAID, under the multi-million-dollar SERVIR-Himalaya initiative. The Nepalese system uses data from the Moderate Resolution Imaging Spectroradiometer (MODIS) instrument on NASA satellites, combined with geographic information system (GIS) and remote sensing (RE) technologies, to carry out automated data acquisition, processing and reporting on exact fire locations. After the successful test phase, ICIMOD rolled out the system in late April in collaboration with the Ministry of Forest and Soil Conservation in all of Nepal’s 75 districts, as part of national climate change adaptation and mitigation efforts. Sudip Pradhan, leader of the project at ICIMOD, told Thomson Reuters Foundation that the system now sends forest fire alerts via SMS and email to 200 subscribers, who include district forest officials and local members of the Federation of Community Forest Users’ Group Nepal. “In view of the country’s large area, satellite data have proved highly useful for near real-time fire detection, monitoring and assessment of burnt areas,” he said. 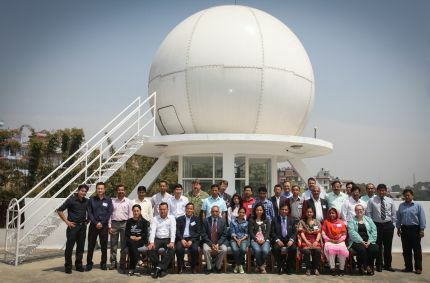 The system, planted on the roof of ICIMOD headquarters, receives images directly from NASA’s Terra and Aqua satellites. These are processed by ICIMOD, and if fires are detected, alerts are sent out to subscribers in just 15 to 20 minutes to help them respond quickly, Pradhan explained. Forest Management Officer Pashupati Koirala said the system would help his colleagues across the country, as well as the wardens of protected areas. The fire notifications are particularly useful as they provide geographical details such as longitude, latitude, district and village names, and even ward numbers, he added. Pramod Kumar Aggarwal, South Asia programme leader for the CGIAR Research Programme on Climate Change, Agriculture and Food Security (CCAFS), warned that the success of the new system will depend on how forest officials on the ground react to the alerts. “Certainly such an information system is a key to efficient protection of forest resources, and further progress can be achieved through timely and efficient response to the forest fire detection and monitoring,” he said. ICIMOD’s Pradhan said the centre has chalked out a plan to share the system with other South Asian countries. Collaboration is underway with Bhutan and Bangladesh, and the technology will be soon transferred to them, he said. Staff in forest departments and others concerned will also receive hands-on training to be able to run the fire detection systems effectively, he added. Saleem Shaikh and Sughra Tunio are climate change and development reporters based in Islamabad. Kathmandu/ISLAMABAD: An operational remote sensing-based forest fire detection and monitoring system for Nepal was officially launched today by the Ministry of Forest and Soil Conservation (MoFSC) and the International Centre for Integrated Mountain Development (ICIMOD) during a regional policy workshop at the International Centre for Integrated Mountain Development (ICIMOD) headquarters in Kathmandu. The system, which was piloted in Nepal over the last year, uses active fire data generated by ICIMOD’s MODIS receiving station for near real-time detection of forest fires. The system is also equipped with an automated alert system, which sends email and SMS notifications to subscribers, including District Forest Officers and focal persons of the Federation of Community Forestry Users in all 75 districts. The system is the first of its kind in the region, and ICIMOD is planning to implement similar systems in other countries of the Hindu Kush Himalayan region. Over the three-day workshop, 30 senior officials from Bangladesh, Bhutan, India, Myanmar, Nepal, and Pakistan joined experts from the United States Forest Service, NASA, and SERVIR-Himalaya – an initiative at ICIMOD supported by the United States Agency for International Development (USAID) and NASA – to receive a two-day technical training on operational forest fire detection and monitoring systems equipped with SMS and email alerts. The training was followed by a day-long discussion on policy, which helped identify gaps in technology, capacity and policy in the Hindu Kush Himalayan region and foster regional cooperation for improving forest fire management. The workshop was organized by ICIMOD under the SERVIR-Himalaya Initiative in close collaboration with United States Forest Service (USFS). It was supported by USAID and the US Department of State. Dr. KC Poudel, Secretary of MoFSC, emphasized the importance of the workshop, and the need to develop forest adaptation strategies under changing climate scenarios that evaluate available mitigation and adaptation options and identify policies and instruments to support adaptation. “Changing climate scenarios call for different approaches to forest resource management. The technology and know-how on geospatial support systems that ICIMOD and its partners have shared with the Ministry and other relevant departments will play a major role in improving the management of Nepal’s valuable forest resources,” Poudel said. “The US Forest Service is pleased to participate in the workshop and share geospatial technology experiences with the countries of the HKH region. Despite differences in geography and culture we share many of the same needs for robust geospatial solutions. The result is responsive and sound forest fire management’ said Brian Schwind, Director USFS Remote Sensing Application Center. “This workshop is an important step in strengthening the capability of countries in the Hindu Kush Himalayan region to better manage forest fires. ICIMOD is excited to be involved in developing and sharing innovative geospatial systems to provide timely reporting of forest fire incidence in the region along with the support and technical collaboration of USAID, NASA the US Forest Service, and the US Department of State,” said Dr. Eklabya Sharma, Director of Programme Operations at ICIMOD. In addition, ICIMOD announced that the 2010 Nepal Land Cover Database will be made available to the public for validation through a crowd-sourcing application on the Centre’s online Mountain GeoPortal. Basanta Shrestha, Regional Programme Manager of the Mountain Environment Regional Information System (MENRIS) programme at ICIMOD, said. “As part of regional land cover mapping at ICIMOD, the 2010 Nepal land cover database will provide the basis for natural resources accounting at the national level”. ICIMOD has completed land cover mapping and change assessments in Bangladesh, Bhutan, and Pakistan as well. Dr. MSR Murthy, Geospatial Solutions Theme Leader at ICIMOD, said, “With validation from its end users, the interactive mapping system will serve as an important information asset in the natural resource sector”. The story first published in Lahore Times on April 12, 2013.